It’s easy to get overwhelmed by the thought of what to make your kids for lunch, what with allergies and kids who refuse sandwiches for reasons that can only be identified as “to make mommy cry”, as well as making sure the snacks you pack provide kids the fuel they need to get through the day. Aviva Allen, kids’ nutritionist, advises giving kids snacks—every two to three hours—that fuel their bodies and brains. So before you stock up on fig bars and baby carrots and call it a day, try one of these six delicious and nutritious protein-rich options to set your kids up for snacktime success. Loaded with protein and a source of healthy fatty acids, cottage cheese is a mild- tasting snack that packs a nutritional punch. Available plain or flavoured in snack-size packs, or from the tub into your own small container topped with anything from fruit to sprinkles (if you have to! ), cottage cheese is a great choice. This delicious, crunchy and satisfying snack is the perfect substitute for salty snacks like chips. High in fibre and protein with a low glycemix index, they’re healthy and can keep you feeling full without having to consume too many. Make your own at home—you’ll find hundreds of recipes online, like this easy one from chef Jaden Hair at Steamy Kitchen (it may take a bit of trial and error to get the right crispiness), or save yourself some time and pick up a bag from The Good Bean on Well.ca or at Costco. These are guaranteed to be a new family favourite and are just as great on their own as they are as a crunchy salad topper or in a homemade trail mix. Making your own granola bars or power balls is a great way to pack protein and nutrients into a delicious snack. You can find school-safe recipes using SunButter or WowButter instead of nut butters, which still offer a source of protein. Check out the recipes for Breakfast Balls and Hangry Muffins (with protein-rich hemp hearts) from Toronto-based bloggers and nutrition consultants Plant Trainers for two great homemade options. A hard-boiled egg is the perfect snack for little hands and is loaded with good fats and protein, as well as a wide range of vitamins and minerals. Just boil up a bunch at the beginning of the week and toss them into lunches quickly and easily. Tofu is naturally gluten-free and low calorie, contains no cholesterol and is an excellent source of protein, iron, and calcium. It’s also really versatile and can be used for everything from puddings to savoury roasted goodness. Make your own in bite size cubes or fry-like sticks or pick up a package of PC Blue Menu Teriyaki Marinated Tofu, cube it and roast it for a savoury-sweet snack the whole family will love. We’re not suggesting that you skip dessert. And we certainly don’t want to be blamed for the mutiny that would ensue at home if there were no treats in the lunch bags. If your kids look forward to their sweet snack, try baking these Black Bean Brownies from Chocolate Covered Katie. Tried and tested, these really do taste delicious. Plus, black beans are very high in fiber and protein, and rich with vitamins and minerals like vitamin A, calcium, iron, manganese, and more! 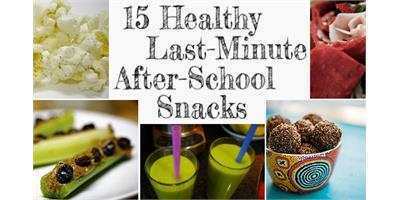 Got any other ideas to share for healthy, protein-rich snacks? We want to hear them! 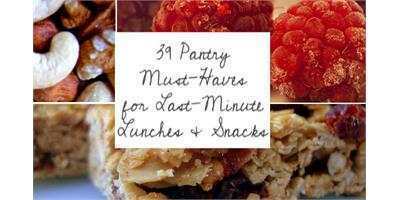 Stock up the pantry for school lunches with these 39 pantry must-haves for last-minute packed lunches and snacks. With school and work, dinner is sometimes a last-minute affair: keep it simple with these 10 super-fast weeknight dinners. Bonus: they’re healthy! Got the brown-bag blues? 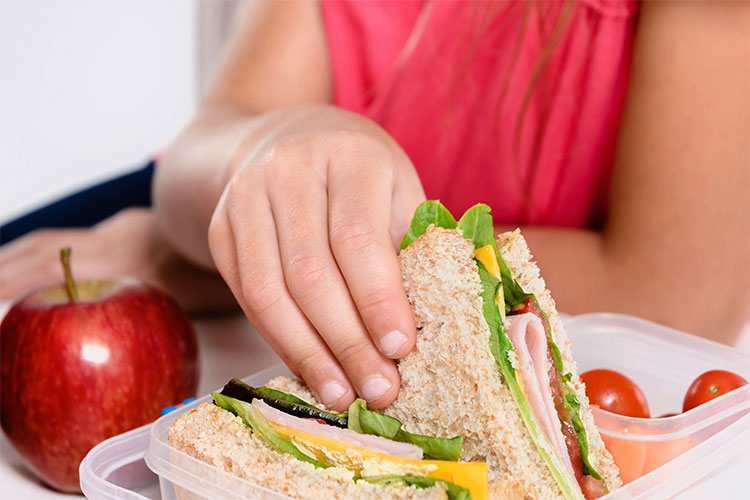 Try these tips for packing school lunches kids will actually eat!